It's horrible being on a tight budget. It means we can't afford to take our boys out places that often. Thomas doesn't mind though, as long as he has his scooter and the weathers ok he's fine. We spend a lot of time outside scooting around, even in this cold weather, just wrap up warm and we're ready to go. After his ride on his scooter we come back to the garden for a bit. Usually playing on everything but in this weather all his toys are put away in the shed so today it was just the swing. Thomas loves his swing, always asking to go higher and higher. It's not always about how much money you spend or how many places you've been to. Sometimes it's just about spending time together, even if it's just in cold damp Leeds right near our house. As long as we can make our own fun, that's all that matters. I'm always listening to music on my phone but hate the ugly generic earphones you get with the phone. The plain style, no imagination at all. That's where Jewelfone come in. 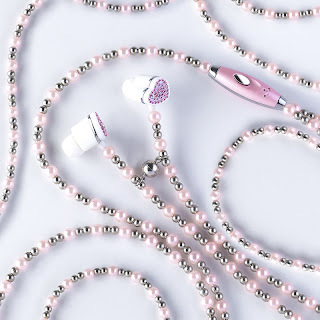 Jewelfones are earphones with imagination, with sparkle, with style. The earphones for style-concious girls. They are made from high quality earphone that can also be converted to a necklace giving you all the flexibility you need whilst on the go. I was lucky to be given a chance to review a pair of Jewelfones. I received the Passion style. Passion Jewelfones have small pink and silver pearls covering the wire with a gem encrusted heart shaped ear piece making it great for the romantics, full of passion. They have a magnetic clasp which attaches round the neck like a necklace which means no more earphones dangling from your pocket when not in use. I find that the earphones are very good quality, perfect sound and somewhat better than the standard earphones that come with phones. I use earphones quite a lot, whilst writing this blog I like to listen to a little music or just whilst I'm relaxing. My niece saw them and now 'just has to have a pair' for Christmas. I'm sure she'll love them just as much as I do. Finding shoes for young children can be a challenge. We all want smart shoes that are comfortable but most brands seem to be either one or the other. SKEANIE shoes are the brain child of Natasha Barber, and Australian mum of 2. She wanted to create a soft soled shoe made from high quality leather that not only are stylish but are also eco-friendly as they are made from offcuts of leather. 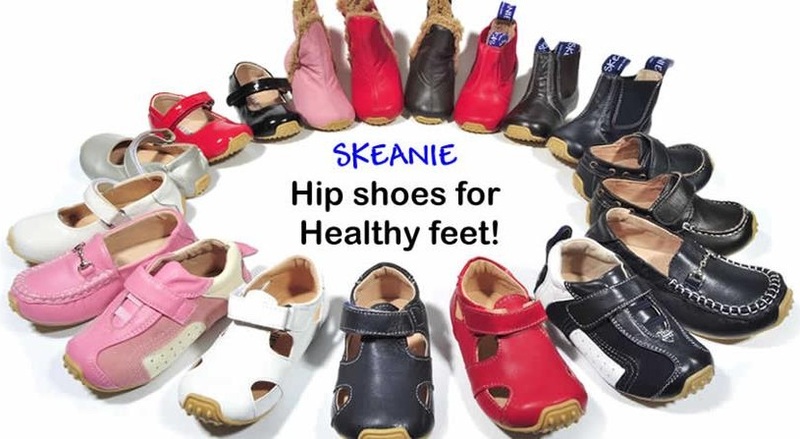 Since SKEANIE launched not have they been highly rated by mums but by podiatrists and paediatricians too. SKEANIE shoes have been designed to protect and nurture little feet and all products are Fair Trade. I first became aware of SKEANIE shoes from their Facebook page. Some of my mummy friends were already liker's of the page so I popped along to have a nosey. I was amazed at how beautiful some of the shoes were. 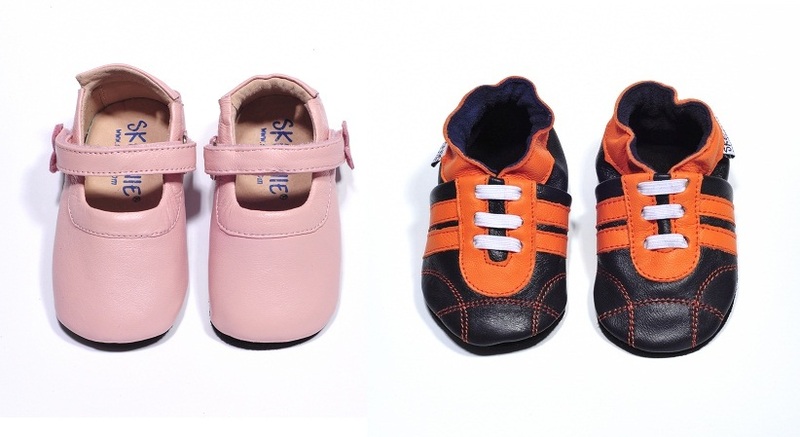 The Infant range includes the gorgeous Mary Jane's and the oh so cute Sporty Sneakers both priced at £26.99, both beautifully designed and very comfortable for babies growing feet. The Infant range have soft suede soles that has perfect grip from crawling and walking babies. The Junior range has the classic Loafers, these can be bought in colours suitable for boys and girls, and the Boat shoes which are so smart and are both £34.99 per pair. The Junior range were specially made for walkers with their innovative flexible rubber sole. We chose the products that we thought would be suitable for the cold weather months, the Snug Infant booties and the Junior Riding boots. 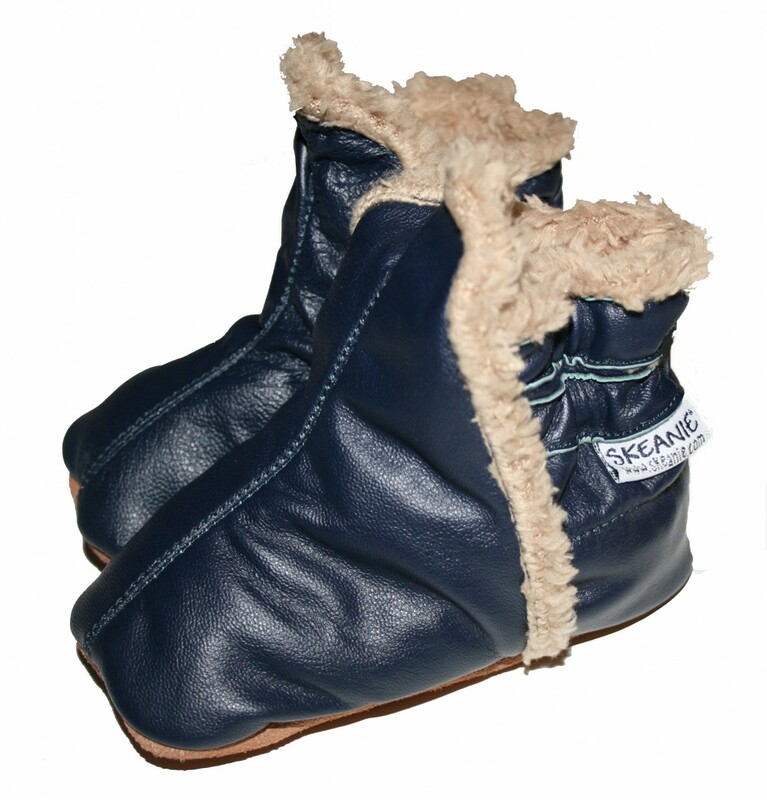 The SKEANIE Snug booties are made from buttery soft leather and have a soft suede sole. They are elasticated along the top to help keep them on the feet and have a snug warm furry lining to keep babies feet warm in these cold months. 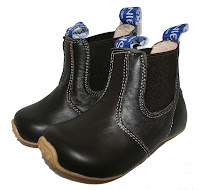 The Infant Snug booties come in 2 colours, Navy and Chocolate. Charlie is walking now and usually ends up in the kitchen finding pans to play with, the only problem being that we have solid tiled floors and usually he would wear only socks and would slip and hurt himself so we had to put a safety gate on the door to protect him. The soft suede on the base of the Snug booties is non-slip and it means that Charlie can now freely walk about without worrying about slipping over. At the weekend we popped out for a meal, taking Charlie for a walk around the restaurant whilst we waited for our food, I was stopped by another mummy who was so fascinated with the booties. She couldn't believe that such a quality leather product was only priced at £36.99, I kindly gave her the SKEANIE website details and we were off on our way happy in the knowledge that another child was about to get their first pair of SKEANIE shoes. The SKEANIE Riding boots are made from eco-friendly leather and have the flexible rubber sole ensuring that children's feet are protected. I personally wouldn't usually buy my boys boots as they always look uncomfortable bulky and heavy but these aren't any of those things. They are light weight, soft and very comfortable. Thomas has worn these quite a few times now, even for Nursery and they still look brand new, the quality is fantastic. Many parents at the school gates have admired Thomas's boots and asked where they were purchased from, each time I've directed them to the SKEANIE website. Being a mummy who is obsessed with my children's comfort, I found these shoes perfect for little feet. Both pairs were easy to put on and both stayed on too. I'm now just hoping that SKEANIE soon decide to sell sizes bigger than UK8 so we can buy the next sizes up for Thomas. You can buy the whole SKEANIE range on their website, the Infant range here and the Junior range here. SKEANIE can be followed on Facebook and on Twitter. I'm forever washing clothes. With having 2 young boys, the loading and unloading of the washing machine seems never ending. There's always something covered in jam, mud, or body fluids, eurgh! Many times I have thrown gorgeous expensive clothing out due to marks, or stains that just wont budge. Dr. Beckmann do a range of products perfect for these situations. Admit it, you've done it too. Rushing to get out of the house, throwing everything in the washing machine and everything comes out pink, yep that red sock went in with the whites, argh, nightmare! Well not any more. Dr. Beckmann have their very own Colour & Dirt Collector sheets. How do they work? Simple, they attract all the stray dye that comes off clothing, meaning that they are the ones that come out looking like a rainbow and not you favourite dress. Basically add one to each wash or when washing something delicate or expensive and watch it get to work. When the load is finished, just take it out, admire the array of colours that may be on it and then thrown it away knowing it protected your favourite garments. Then comes stains! I hate stains with a passion. As soon as I spill a drop of gravy from my fork I'm like a person from the Matrix, in slow motion trying to catch the drop before it stains my nice white top (because whenever you spill something you'll always be wearing white) but I'm never quick enough. Dr. Beckmann do a Stain Devils Survival kit. It comes with 3 different bottles and each one is used for removing certain stains, over 40 different stains! They are so simple to use too, simply either moisten the stain with the solution and leave for 3 minutes to work or sprinkle to powder over the stain and work it into the fabric for 3 minutes. After the 3 minutes just dab with a damp cloth till all traces of the stain are gone. Don't know which solution or powder to use for which stain? Simple, the Dr. Beckmann Stain Devils Survival kit comes with a handy fridge magnet which clearly states which products to use for each stain. Now you don't have to struggle to read tiny writing on bottles and it's always to hand. The Dr. Beckmann range really is a life saver for busy mums like me and I will definitely use them in and on my washing from now on! Thomas loves baking so when Aldi asked if we wanted to review a baking set over the holidays we agreed. The set includes everything needed all in smaller sizes, perfect for children's small hands. Including, bowl, spoon, whisk, jug, sieve and much more, everything you'll need for making buns, cakes or biscuits. We've tried making a few different things, buns, muffins and even cookies. We are trying to find a ginger biscuit recipe at the moment which is proving difficult. One that is child friendly and easy to do so that we can use the shape cutters. I'm sure we will use them in due course though. The measuring spoons may be small but still have the perfect measurements making measuring out icing for the tops of buns easy to do. Even the small sieve means that Thomas can help with every part of baking now. Thomas enjoyed the whisking and spooning out the mixture into bun cases, feeling part of every single bit of the baking meant that Thomas was involved and we bonded over making our favourite treats. You can purchase the baking set in Aldi stores. Aldi can be followed on Facebook and on Twitter. I like to buy Fairtrade products and Visionary Soap was one of the first companies to launch fairtrade beauty products supporting their producers and suppliers. All their products have been certified with international fairtrade standards. Their products don't contain synthetic dye or fragrances, alcohol or animal products, they are quite simply made from butters, vegetable oils, essential oils and botanicals. Using this in the bath was so relaxing. They seemed to ooze moisture into the bath and made my skin feel so soft. Each bath melt can be used twice and are extremely moisturising. The bath melt contains 37% fairtrade ingredients and the minimal requirement to be certified is a mere 5% so they are well above the recommended. The sweet orange scent in this balm is so lovely. Used after the bath, it gives soft skin and with it being highly concentrated, a little bit will go a very long way. This product contains 99% fairtrade ingredients and even comes in a recyclable tin. I suffer with very dry lips and so was delighted when I used this lip balm. Not only is it very fruity indeed, it is also made with olive oil and shea butter to give the lips a highly moisturised feeling and keeps them feeling hydrated for a long time. Sample soaps including - Lavender, Lemongrass, Geranium Rose and Cinnamon Orange Clove. These organic soaps are made using the traditional cold process method and have 60% Fairtrade ingredients in them when the requirement to actually be certified as Fairtrade is only 2% so they are hugely above what is needed. The soaps are extremely good quality, as soon as they are opened the scent from them spreads across the room and gives off a very relaxing ambience. Out of the four, my favourite is the Geranium Rose, it makes my skin extremely soft and the beautiful scent is just perfect for a nice hot relaxing bath. 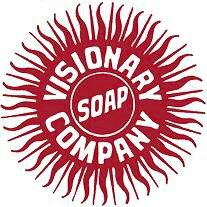 So if you are looking for a company who look after all the employers, make great products and are organic, then look no further than The Visionary Soap Company. You can buy all Visionary Soap's products from their website. Visionary Soap can be followed on Facebook and on Twitter. Everyone knows that nuts are good for you but did you know that they are good for your hair too? 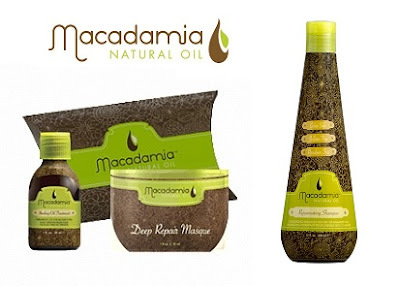 The natural ingredients in macadamia nut oil and argan seed oil helps the hair heal whilst also nourishing it and revitalising even the most driest hair. I have been in desperate need of some hair treatment. For years I have dyed my hair, making it dry and very brittle. I only ever coloured my hair for self-confidence. Having a dull blonde colour means that in summer the sun would lighten my hair to a grey colour which I hated. At about 15 years old I started colouring my hair lighter to give me a medium blonde colour and have done this ever since. 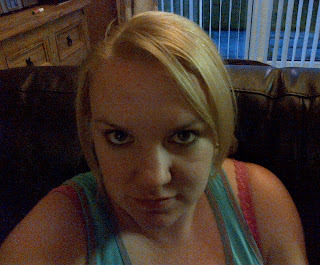 Every 4 to 6 weeks colouring it, over and over which ruined my hair. The bleach and peroxide have made my hair dry and very brittle, even brushing my hair gets hard as the brush struggles to go through it. For the past few years it got so bad that I just started tying my hair up to try and mask the dry sticking out bits but would love to be able to wear it down again. 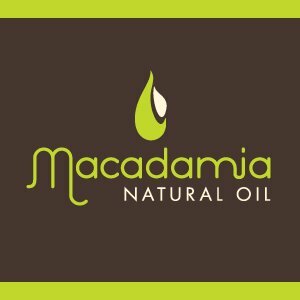 I was sent a few samples to try from the Macadamia Natural Oil range. The Get Hooked sample pack, which consisted of a 30ml macadamia healing oil treatment and a 30ml deep repair mask. I was also sent a 60ml bottle of Rejuvenating shampoo. Although they might sound like small amounts, they actually went a long way as even on my long hair I only needed a little. All three had a lovely scent and were easy to spread out across my hair. The deep repair mask can be left on for 7 minutes for damaged hair so I did exactly that. Straight away my hair felt softer and I could actually get the brush through it for a change. I blow dry my hair and usually after doing so, my hair would be frizzy and sticky out, the products seem to settle it down and instead of a massive frizz bomb on my head I have lovely sleek hair that's shiny and soft too. So now I know, not only can I eat nuts to keep me healthy, but I can also use them to make my hair healthy too! As it's bonfire night tonight and fireworks will be setting off all over, fires will be lit and wide open, Fireman Sam has set out his list of safety tips for children (and adults) to follow to make sure it is a fun yet safe experience. 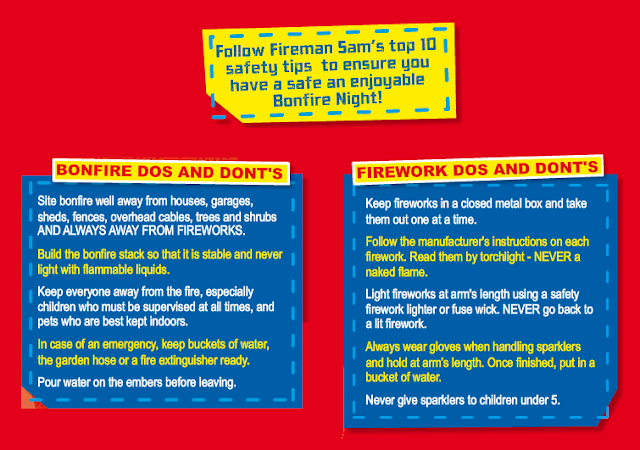 I hope you follow all the tips and have a enjoyable but safe night and remember, if you are taking young children out, keep them supervised and away from fires and fireworks at all times.